https://youtu.be/6ReaUPXLO9w The key to developing real power in striking is good body mechanics – coordinating the arms and hands with the rest of the body and moving everything as an integrated whole. Ideally, the hands should be kept broadly in front of the chest, with power being generated by the movement of the hips, which are, in turn, driven by the legs. Most people do this by using a structure that is basically the same as that of a boxer; pivoting on the front foot to turn in with the forehand strike. 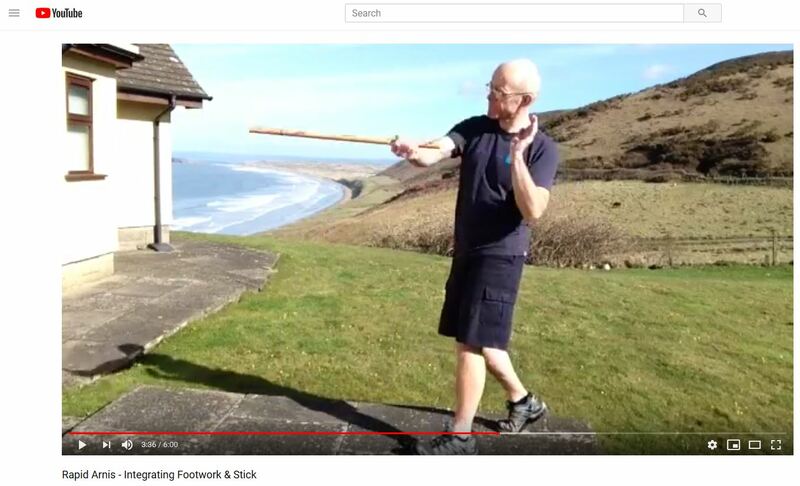 However, doing this with a stick tends to force the body to slightly over-rotate and expose the right side of the head to counter attacks, which (owing to the over-rotation) are particularly difficult to defend. Rather than pivot off the front leg, I prefer to use the back leg. This means that the front of the body stays much squarer to the opponent and makes counters much more easy to defend. It also fits well with my general footwork and striking pattern. On 11 Oct I was featured on the Primal Radio podcast – it is available on all major podcast platforms – I have put the links for iTunes & Spotify at the top of this post. Primal Radio is a great podcast with informative and entertaining interviews with the likes of Pat O’Malley, Mike Blackgrave and Andy Janson. We hold regular classes every Thursday evening at Legends Gymnasium in Nottingham. Every year the British Council of Kali Eskrima Arnis Instructors holds a Filipino Martial Arts Festival. The video above shows some of the highlights. Next year’s festival will be on the weekend of 21/22 Sep. Being able to move around and hit hard is a skill that takes time to develop. When I was younger, I would read interviews in magazines, where the interviewee would often say how important footwork was, but in the accompanying pictures would stand still to deliver his (or her) techniques. Of course many people do spend time on their footwork – skipping, running tyres, using mobility ladders etc – but, this tends to leave people with the ability to bounce around quite quickly, when what is really required is the ability to coordinate the hands and feet. I like to start off with the most basic striking pattern – downward figure 8 – and combine this with forward and backward steps. To begin with I typically have people only move their right foot. The key here is to deliver the strike toward what will be the front foot. I then add in an upward figure 8, one half of the X, Sunkite, Abanico etc and then the left foot, before progressing to movement in 4 directions. Throughout movements should be smooth – the stick hand never stops moving – and strikes are seldom delivered from a stance with feet planted.